A couple’s marriage proposal is probably one of the most significant and important moments in their lives — a story they will tell for years to come to friends, loved ones, children, and maybe even grandchildren! While some choose to propose with an over the top and extravagant moment, others go for something subtle and sweet. No matter what the moment looked like, it’s always something to remember, filled with love, warmth, and romance. 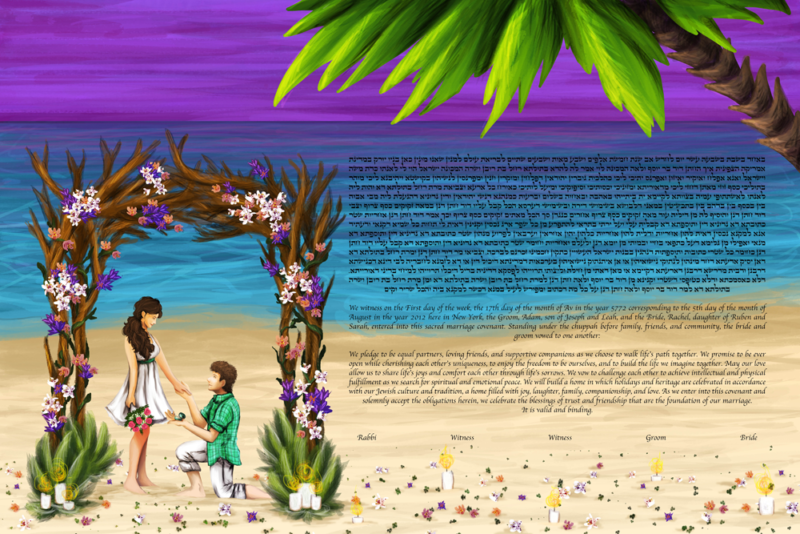 The One Love Ketubah captures this romantic moment between a couple — a candlelit proposal on the beach with a gorgeous tropical sky in the background. This Ketubah is perfect for the couple that has been searching for a work of art that displays both the Ketubah tradition and their unique style. 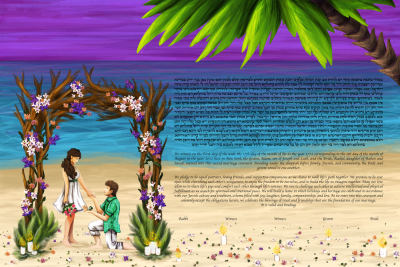 With the vibrant hues and romantic beach setting the One Love Ketubah is meant for the couple that is more relaxed and free spirited, and perhaps are a little bit of a beach bum at heart. This Ketubah will be the bold centerpiece of your home — a work of art that beautifully symbolizes your long-lasting love!